If you are using the latest version of vMA 5.5, there is currently a known issue when using resxtop. After successfully logging into the ESXi host, the command prompt is returned immediately and resxtop is not actually loaded. Once you have executed the above command (only required once), you now will be able to connect to your ESXi host using resxtop. Engineering is working on getting the vMA release notes updated as well as a KB article published and we will have fix for this in the a sub-sequent update/patch release of vMA. The folks over at VMware Labs continue to pump out awesome new Flings and just yesterday, they released another one called VistualEsxtop, which is an enhanced version of esxtop and resxtop. 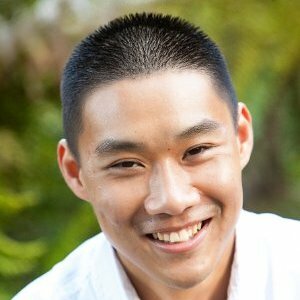 It is no surprise, the Fling was developed by VMware Engineers working in the Performance group such as Priya Sethuraman, Zhelong Pan, Haiping Yang and Joanna Guan, some of which who helped develop the original esxtop utility. While reading the instructions, I noticed VisualEsxtop is supported on both Windows and Linux and is loaded by a simple .bat or .sh script. So I wondered if it could run on Mac OS X? Well, it turns out the script uses a utility called readlink which does not operate the same on Mac OS X and will thrown an error. However, since VisualEsxtop is just a Java application, you can manually load the VisualEsxtop and the necessary library files. Note: For ease of use, you can even create a shell script which executes the command so you do not have to type it out each time. One really cool feature of VisualEsxtop is the use of color coating for important counters and issues. In the screenshot below, you can see I have a VM that is dropping packets and it is automatically highlighted for me. I would highly recommend you check out VisualEsxtop and add this to your toolbelt of tools for troubleshooting and diagnosing performance issues in a vSphere environment! If you have any feedback or questions for the engineers, please leave them in the comment section of the VisualEsxtop Fling. Yesterday I received a question about the specific vSphere privilege that is required to view RESXTOP data on an ESXi host. The reason for this request was to create a restricted role for a group of users who only needed to have access to RESXTOP performance data. I did not know the answer off the top of my head, but it was a pretty easy to narrow down the specific privilege with a quick test in my lab. Through the process of elimination, it turns out you just need the Global.Service managers privilege to view only RESXTOP data. It may not seem intuitive, but the Service Manager is responsible for providing vSphere API access to both RESXTOP as well as vScsiStats interfaces which I have written about here. 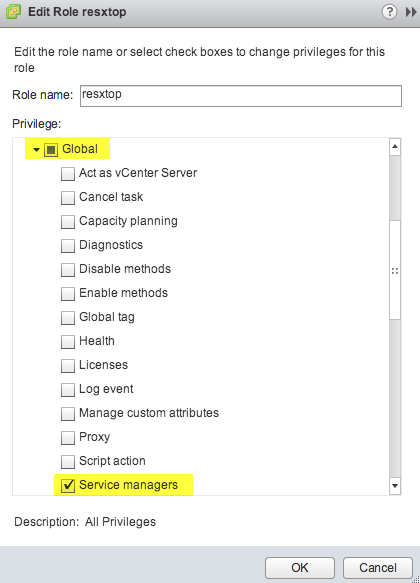 In my lab, I created a new role called resxtop and then associated the role with the user(s) within the vSphere inventory. You can centrally manage this using vCenter Server or you can do this directly on an ESXi host, but you will need to ensure the role is create on each and every single ESXi host along with it's user association. 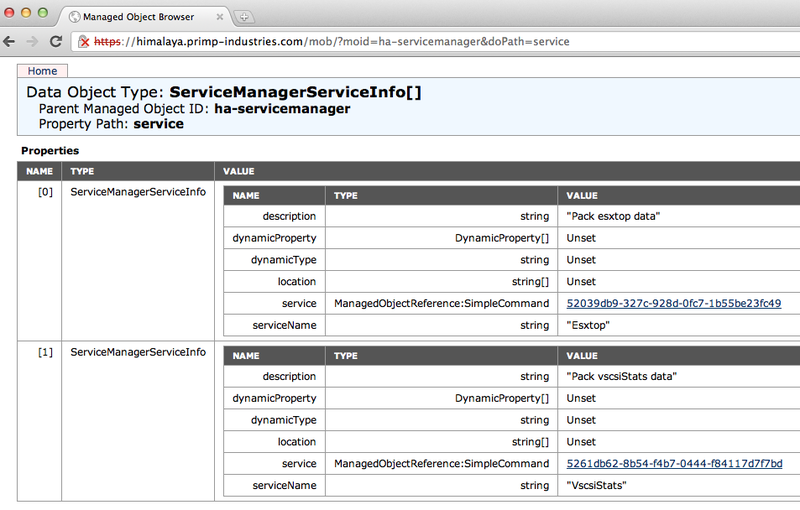 In vSphere 5.1, VMware introduced a new managed object called the Service Manager. The Service Manager is a generic object that wraps the execution of a single command and it requires a specific set of inputs to invoke a particular service command. This is particularly interesting as it allows users to access both the ESXTOP and vscsiStatsinterface using the vSphere API. Prior to vSphere 5.1, to use ESXTOP you would need to either login to the ESXi Shell to run the local ESXTOP command or connect remotely using the RESXTOP utility which is only available on a Linux system. For vScsiStats, you would need to login to the ESXi Shell as a remote version of this tool does not exist. The Service Manager used to be a private interface, an interesting tidbit is that some of you may have already interacted with this interface without even realizing it if you have used PowerCLI's Get-Esxtop cmdlet. 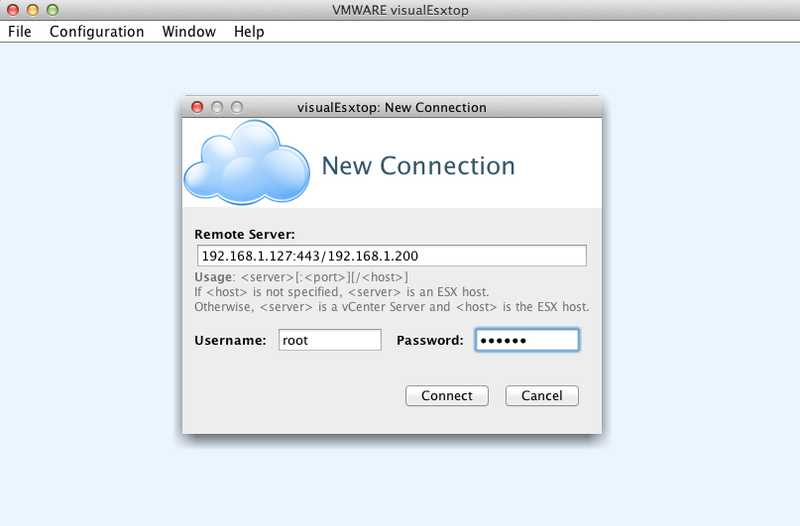 In this article I will show you how to programmatically access ESXTOP using the vSphere API. UPDATE 02/15/2017 - Please see this updated article here for how to access this API using vCenter Server. Disclaimer: You should try to limit the use of these interfaces for statistics collection or debugging/troubleshooting purposes as there is a certain amount of overhead when running these commands. It is also important to note that since the output is based on the implementer of the service, there is no guarantee that output would not change from one release to the other. To demonstrate the ESXTOP interface, I have written a sample vSphere SDK for Perl script called getEsxtop.pl which I will use to explain each operation. Please note the data set that is retrieved is in it's raw data form and requires a bit of data processing. Note: This diagram was created using yuml.me and here is the raw text in JSON format if you are interested. If we take a look at the second line as an example |PCPU|LCPU,24|Core,12|Package,2| we can see that PCPU counter contains 24 LCPU that you would need to then enumerate as well as inventory information describing the CPU's logical cores and physical socket. Remember you will need to correlate with the counter definitions that was extracted earlier from the "getcounters" and this will help you build up the data. I do have to say it can be a bit confusing when you first look at the raw data, but as you start to play with it a bit more, it will start to make sense. Two useful references that can help with parsing the data is the ESXTOP bible and an article that Luc Dekens wrote awhile back exploring the Get-Esxtop cmdlet which I mentioned earlier leverages this exact interface. Even though it is nice to see the ESXTOP interface be accessible via the vSphere API, it is not the easiest interface to use and is definitely geared more towards a developer. For extracting general performance data, I would still recommend using the Performance Manager managed object or one of the above mentioned command-line interfaces. 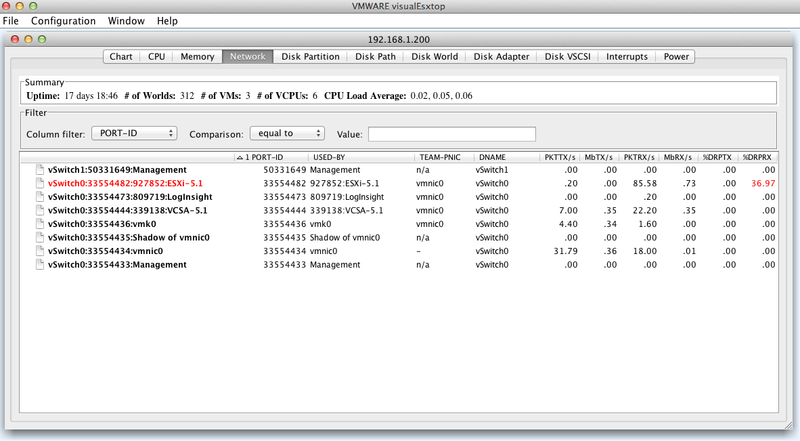 In the next article, I go into more detail about the vscsiStats interface and how to consume it using the vSphere API. Awhile back I wrote about an resxtop bug found in vMA 4.1 in which it no longer functions with vMA's vi-fastpass component and still requires you to provide the username and password even though vi-fastpass has been initialized for a given target. There was also a slight quirk when using esxcli and vi-fastpass, in which you had to specify in addition the --server of your ESX(i) host which allowed you to utilize vi-fastpass. With the latest release of vMA 5, both of these issues have now been resolved for both ESXi 5 and ESX(i) 4.x. I would highly recommend you download the latest version if you would like to make use the vi-fastpass component in vMA.